Born in 1987, lives and works in Dijon. Léa Le Bricomte graduated in 2011 from l'École Supérieure d'Arts & Médias de Caen. Although representing a younger generation of contemporary French performance art, Le Bricomte has been quite active in the field in the last five years and have presented her work at different venues in France, as well as festivals like Infr'Action Sète and Infr'Action Paris but also at the Live Biennale in Vancouver in 2010. She is also realizing performance work as Stone & Charnel together with Joël Hubaut. Le Bricomte states that "my performance work metamorphoses my body into a vibrant landscape for glued, coagulated, shiny snails-tumors. The change of perspective produces a slip and reveals the true speed of a snail. I want to bring up a new reality that I claim as the right time.. Skin and fireworks show under the slime. 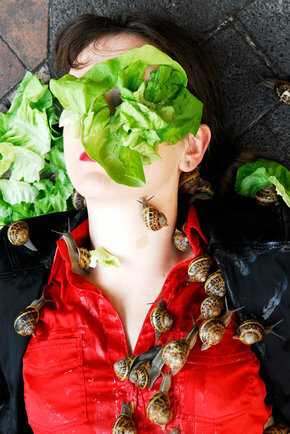 The dance of snails is a slow ritual of subtle retrieval."